The season’s SEC Championship features the Alabama Crimson Tide against the Georgia Bulldogs in a slated 4 p.m. kickoff at Mercedes-Benz Stadium in Atlanta. CBS will carry the game nationally. Alabama rolled through the regular season in a highly impressive fashion. The Tide played 12 games and they won them all by double figures. They were also a solid bet over the second half of the season at 5-1 against the spread in their last six games. The total went OVER 53 points in Saturday’s 52-21 victory against rival Auburn as 26-point home favorites and it has gone OVER in eight of their 12 games this year. When you combine an offense that is unstoppable with an average of 49 points a game and a defense that is only giving up 13.8 PPG, it is easy to see why Alabama has yet to play a close game this season. Tua Tagovailoa has established himself as a Heisman frontrunner at quarterback with 3,189 yards passing and 36 touchdown throws. He tossed five touchdowns in Saturday’s win as part of his 324 passing yards on the day. Georgia could work its way into the College Football Playoff with a win after going 11-1 SU in the regular season. The lone loss came against LSU as a seven-point road favorite in mid-October. The Bulldogs took care of business down the stretch at 5-0 SU with a 4-1 record ATS. The total has gone OVER BetAnySports’ closing line in five of their last six games. 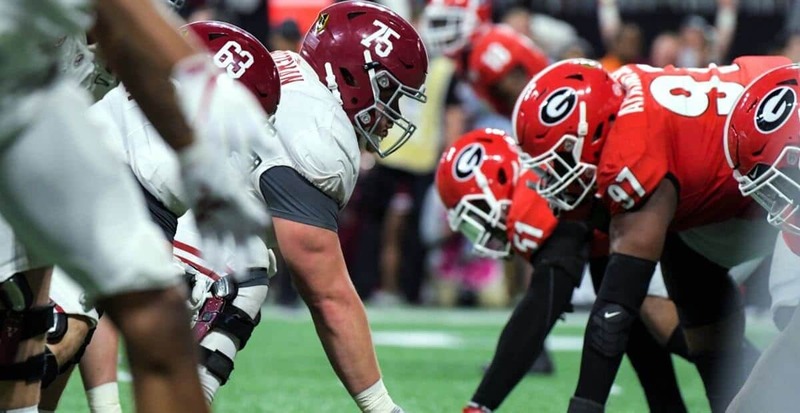 The only chance Georgia has to keep things close on Saturday hinge on its ability to run the ball while keeping Alabama from lighting up the scoreboard. This team’s top two strengths all season long started with a ground game that grinded out an average of 259.8 yards a game complementing a defense that held opposing teams to 17.2 PPG. It would also help if quarterback Jake Fromm played his best game of the season. You would think that this game might remain close given the recent history between these two teams, but Alabama has been in a class of its own all season long and that is not about to change this Saturday with a SU win that covers the spread.